Please note that wildcard certificates are currently not supported. Navigate to the SSL/TLS Certificates page. A list of your domains display. Click the Add button to the right of the domain you wish to add the SSL cert. On the next page you can select a free Let's Encrypt or paid Comodo certificate. The first option is to add a FREE 'Let's Encrypt' certificate. This is just as secure as a paid certificate. The only difference is that it does not have the same seal of trust which some users prefer to display to their visitors. This option is recommended for simple websites such as a WordPress blog and other non-critical public content. The second option allows you to add a paid Sectigo SSL certificate, which costs $15/year. it's professionally signed by Sectigo and displays a certificate seal of trust. it's recommended for ecommerce sites, customer login areas, and any other critical public content. gives your visitors the best indication that your website is secure and the connection is safe. provides a certificate warranty if it fails to properly validate the information contained in a digital certificate. How do I purchase a signed SSL certificate? 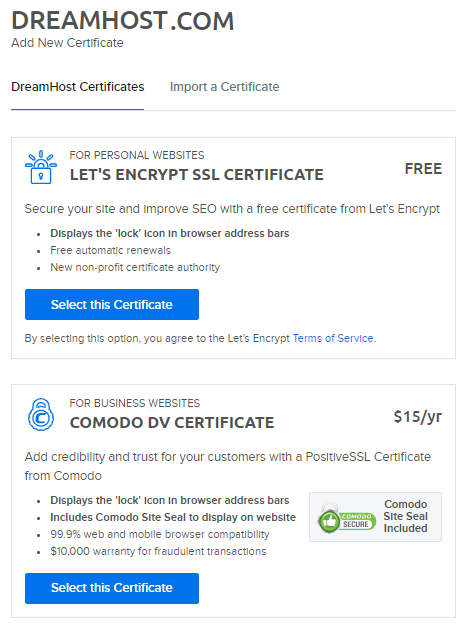 If you have chosen not to purchase a signed SSL certificate from DreamHost, below is a list of SSL Certificate Authorities from which you may also purchase. Please note that the specifications for all SSL certificates are NOT the same. You have to compare features as well as prices to see what's the best value. You can copy the Certificate Signing Request (CSR) in your panel and use it to purchase your signed SSL certificate from another Certificate Authority, if you have not chosen to purchase one from DreamHost. For more details on this option, please visit the What do I need from DreamHost before purchasing a third-party SSL certificate? article. How long after adding the certificate will HTTPS function?